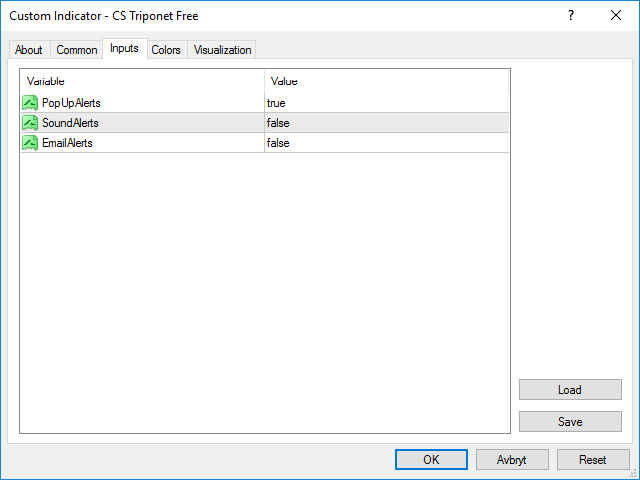 CS Triponet Free is an indicator used for manual trading catching trends and the FREE version only works on AUDCAD, this might not be the optimal trending pair right now. Signal is given to either go long or short and the market orders are placed manually by the user on timeframe M5, stop loss and take profit levels are also set by the user. Advise to search for key levels highs and lows, support and resistance. Indicator equipped with alert functions - Visual, popup with sound and email which tells the trader when to take action and ride along with the trend. When signal is given it's advisable to enter the market only on M5 as this is the signal main confirmation timeframe and the other 2 is H1 and H4. I personally recommend to actually ride along when a market order is placed to the journey towards the key-levels you have found, exit too early could result with a ruined trade. Everybody has their own trading style and this was just a recommendation. 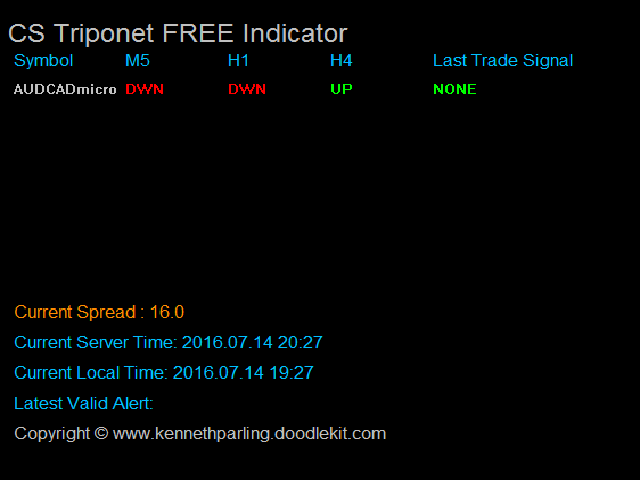 Test the indicator and see what you think about it. Well follow the described steps above. On the chart you will have information about the M5, H1 and H4 charts signals. To enter the market correct, all 3 has to be either green -Up or red-Down and the status 'Last signal' has to be either Up or Down, then you have a confirmation to enter the market. If no signal been given the status 'Last Signal' displays NONE. Remember this indicator wont generate 5-10 signals a day as it's a long term trend following indicator and should not be mixed up with scalping or similar. It could be day(s) with out any new signal but when it comes, be sure to ride along!